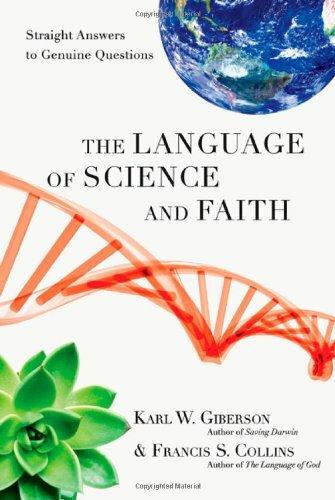 Language of Science and Faith — Karl Giberson, Phd. Christians affirm that everything exists because of God--from subatomic quarks to black holes. Science often claims to explain nature without including God at all. And thinking Christians often feel forced to choose between the two. But the good news is that we don't have to make a choice. Science does not overthrow the Bible. Faith does not require rejecting science. World-renowned scientist Francis Collins, author of The Language of God, along with fellow scientist Karl Giberson show how we can embrace both. Their fascinating treatment explains how God cares for and interacts with his creation while science offers a reliable way to understand the world he made. Together they clearly answer dozens of the most common questions people ask about Darwin, evolution, the age of the earth, the Bible, the existence of God and our finely tuned universe. They also consider how their views stack up against the new atheists as well as against creationists and adherents of intelligent design. The authors disentangle the false conclusions of Christians and atheists alike about science and evolution from the actual results of research in astronomy, physics, geology and genetics. In its place they find a story of the grandeur and beauty of a world made by a supremely creative God.